This area is located less than a 1/2 hour drive from Marquette. See this website for more information on the properties in this area. In general, it is a well controlled site for homes and camps along a beautiful river basin. Originally, beginning around 80 years ago, this was a place with only leased land and, as a result, relatively crude camps. Several years ago the land was purchased, divided and sold to the current residents. Ownership of the property allowed investment in homes and camps so that the area is now a very desirable location. There are three good reasons to buy this property. First, this property is located in Michigan's Upper Peninsula. The terrain is both rugged and beautiful, far from any concentrated populations but yet close enough for convenient access from anywhere in the midwest. Chicago, Minneapolis and lower Michigan are all easily within 8 hours by car and the entire US is reachable from the modern Marquette airport. 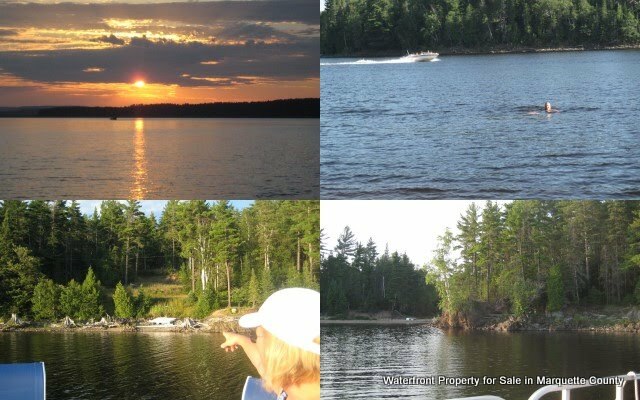 Second, this property is less than a 1/2 hour drive from Marquette where you will find restaurants, shopping, world class golf, medical care and a generally wonderful place to live. Be sure to check out the links provided for information about Marquette county. You will find an area that has been named one of the best places to retire by CNN. Third, this property is located on the north side of the basin. In addition to the obvious benefit of a southern exposure, there is also access to Marquette that is simply not available from much of the other property on this basin. For example, from the property that is directly across the water, it will take close to an hour to get into Marquette due to the lack of a direct route that is available from North Basin Drive. Thus, the three reasons to buy property are, as usual; location, location and location. You can view the listing for this property here. The property is located below.